Other Ingredients Polydextrose, water, gelatin, xylitol; less than 2% of: blend of oils (coconut and/or palm) with beeswax and/or carnauba wax, colors (annatto extract, blueberry and carrot concentrates, purple carrot juice concentrate), malic acid, natural flavors, and sucralose. Contains: tree nuts (coconut). Serving Directions As a fiber supplement, adults take two (2) gummies per day. Chew thoroughly before swallowing. Brand Intellectual Property (IP) Statement Information Supplement your healthy diet with prebiotic fiber Fiber is an essential part of a healthy diet, but many of us don't get enough daily fiber. 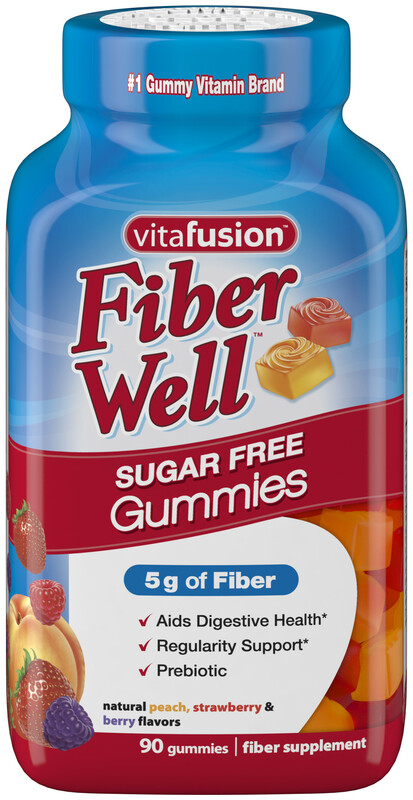 Vitafusion™ Fiber well™ makes it easy to get the fiber some people need - all in a delicious sugar free gummy! Now you can enjoy your fiber! The soluble fiber in vitafusion™ Fiber Well™ aids in digestive health, supports regularity and provides a prebiotic effect in the gut. * With great tasting, natural fruit flavors, adding fiber to your diet has never been easier. Precautions Take only as directed. Do not exceed suggested dosage. If you have a medical condition, are on medication, or are pregnant or nursing, please seek the advice of a qualified health care professional before using. If minor gas or bloating occurs, reduce daily serving. Do not use if inner seal is broken or missing. This product may settle during shipping. Do not expose to excessive heat or moisture. Colors will darken over time. This does not alter the potency of the product.